This week we are featuring artist, Emily Keating Snyder! We love her playful approach to her artwork and how she lets her pieces reflect the imperfections of the human hand. Katie was kind enough to tell us a little more about herself, her artistic journey and her pieces. She also made an awesome video to teach you some of the techniques she uses in her watercolor paintings! You have to check it out, especially if you’ve been wanting to get into watercolors, but haven’t been sure how to approach them. Emily will give you the confidence to give it a try and experiment – what artists do best! “I’m a colorful artist, designer, and art party hostess in Los Angeles. Playfulness and a good sense of humor are huge in my life. My favorite materials to work with are paper, paint, watercolor, collage, and embroidery. I believe strongly in the importance of working with our hands and not being too precious with art. After studying art and art history as part of my custom concentration at NYU, I had a few different art world jobs then made the leap to independent creative (and doggie caregiver) a few years ago. I’ve been grateful to show my work in New York, LA, and other major cities and to be featured by Saatchi Art and The Etsy Blog… and here on Castle Foundations! I’ve been making art my entire life and to this day the best creative advice I’ve ever gotten was from my kindergarten art teacher. Whenever we were working on a project and wanted to rip it up and start all over after one misplaced tempera paint mark, she would say, “Turn your mistakes into something else.” I don’t think it was purely out of encouragement or necessarily kindness. It probably had more to do with needing to ration an entire school’s paper supply, but it has always stayed in my head and helped curb perfectionism in my art for 25 years. This week we are featuring Chanine Hameetman Illustrations! We love Chanine’s illustration style! They are such a representation of happy moments and make us smile just looking at them. Many of her illustrations are representations of her daily life and they make you want to jump right into the drawing and join the fun! 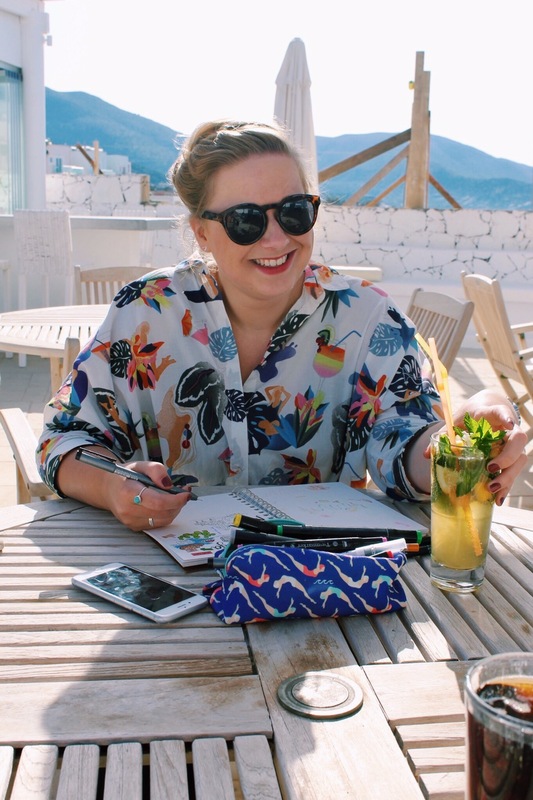 Read on to learn more about Chanine, how she discovered her style and her goals for Chanine Hameetman Illustrations! : My name is Chanine. I’m 27 years old, born and raised in Spijkenisse, the Netherlands, which is a small town near to Rotterdam. I’m happily married to Marius and we live in a cozy apartment with our bunny ‘Gijs’. I have attended an arts academy for one year, but then decided to become a primary school teacher. I’ve always loved to draw a little in my spare time. Nowadays I’m almost always carrying my drawing stuff with me. My friends and family are used to see me drawing all the time. : Your illustration style is so fun and original! How did you get to where you are in terms of determining what your illustrations would look like and finding your own personal aesthetic? : Drawing always kept my attention. For this reason I followed an illustration workshop last year. The illustrator of this workshop told us that the best way to develop a style is to complete at least one drawing every day, for forty days. I followed her advice and from that day started to draw and share my drawings on Instagram for forty days. I drew everything I experienced and saw in my daily life. This experience caused my style to self-develop, because automatically started to draw the way I liked it the most: black lines first and then coloring it with bright colors. Maker Monday: Stevie Rozean Co. This week we are featuring Stevie Rozean and her amazing shop filled with all things lettering, illustration and design! Stevie can do anything from painting your childhood home or lettering your favorite quote, to designing your wedding invites! She also has a wonderful outlook on pursuing growth as a artist and the importance of practice when it comes to developing your style. Keep reading for great insight and to learn more about Stevie Rozean Co.
: I’m 22, passionate about pursing my dreams and inspiring others to do the same, newly married and a sucker for desserts (specifically donuts). I’m from Cincinnati, OH but moved to Springfield, MO about 5 years ago to attend college. : How did you discover your love of creating art and decide that you wanted to pursue it and start Stevie Rozean Co.? : I’ve always been an artist, but it wasn’t until about five months ago that I decided to turn it into a business. Throughout middle school and high school I dabbled in starting Etsy shops and occasionally did commissioned pieces for friends and family. I knew I loved it, but I couldn’t clearly see a path in which I could turn it into a career. So I studied journalism (I also love to write) in college and got a really great job as a reporter after I graduated. The job was very demanding, of both my time and energy, from the very beginning. So as a way to decompress after work, I started painting. I would paint from nearly the time I got off work till I went to bed. I started posting pictures of my work on social media and as I did, people started responding. My dream of owning a business was suddenly right in front of me. After much prayer and talking it through with my husband, friends and family, I decided to take the leap. I quit the job that fit perfectly with my degree and paid well to pursue this little business of mine. This week we are featuring Jessica of Oh Jessica Jessica! She is an animator, character designer, illustrator and Etsy shop owner! Although she may be wearing many creative hats, all of her work is thoughtful in detail and meaning. Jessica hopes that all the characters she creates connect with people in some way. We love Jessica’s style and story, and if you’re on the search for some awesome pins or illustrations, look no further than Jessica’s shop! : Hello! My name is Jessica Harris and I’m a Melbourne-based animation artist focused on narrative storytelling. I love bright colour, changing my hair style, and listening to songs on repeat. I live in a tiny one bedroom apartment with my partner, Adam, and right now my art studio is crammed into the corner of our lounge-room. This week we are featuring Michelle Bolick! She is the maker behind all the amazing creations of PineNeedle Stitches. We love everything Michelle is doing in her shop from her wood slice paintings, hand stitched books to ornaments. When so many things are made in the masses and digitally viewed it’s nice to see natural medias and hand created notebooks still in use. She is also doing great things through the sale of her products through her initiative the, Love You More Project, benefiting Alzheimer research and awareness. As most of you guys know, we think it is so awesome and impactful when people use their talents to give back. To learn more about this project and Michelle’s journey behind PineNeedle Stitches, read on! : My name is Michelle and I am a high school art teacher by day, artist and small business owner by night. Creating is my passion and my high school art teacher inspired me to be where I am today. When I’m not working, I’m spending time with my husband, family or my sweet basset hound, Winslow!